YWAM Publishing offered us several choices from their Heroes of History series of books and we chose to review Heroes of History- Alan Shepard. Sebastian chose this particular book because of Alan Shepard's time in space. Last year we read the Milton Hershey book in this series and Sebastian and I thoroughly enjoyed the book and corresponding study guide. 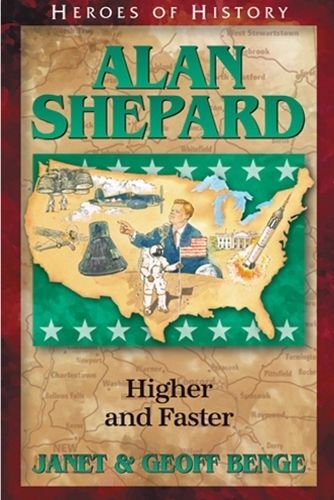 Because of our positive experience with the last book, I had high hopes for Alan Shepard: Higher and Faster. We were not disappointed! This series of books highlights how these men and women were shaped into the Heroes we know about. By highlighting the virtues the hero possessed, we are focusing on Christian values and building character in our children through quality literature that nurtures the mind. "It is a very good book and it shows aspects of Alan Shepard's life that not many other books show. For instance, it talked a lot more about his childhood. They explained the ups and downs like when his friend's glider broke and when he got a job working at the airport. My favorite part of the book was when Alan Shepard was in the military working for the Air Force and flying airplanes. I learned that hard work and perseverance is what turned Alan Shepard into a astronaut." Along with the book, we were given a unit study guide to go along with the book. In this guide there is a biography of Alan Shepard; guides for small groups, classrooms, as well as homeschool; and unit study guides in two parts. In the homeschool guide, there is a great section that helps you use this as part of your core curriculum or to supplement an existing curriculum you are currently using. In the unit study there are tons of discussion questions to go over after every chapter. They even reference page numbers so you can easily go back and read something if you don't remember what they are asking about. There are also opportunities for essay questions, creative writing, hands-on projects, audio/visual projects, arts and crafts, vocabulary, timeline, and so much more! I am all about character development so we discussed that after he read the book. It was a fast read. It was a "light" read for my rising 5th grader but it was enjoyable. He said it was a perfect nighttime treat at the end of a day. I liked how it focused on Alan Shepard's determination, hard work, and perseverance that shaped him into an astronaut. The study guide was filled with things to do, discussions to have, and ways to make this book into a substantial learning environment in my home. It was a fast read. (Yes, this is something we like and don't like!). Sebastian wanted a bit more to read because he is a voracious reader. It makes me want to buy all the other books in this series! Ok, maybe this isn't a problem, haha. This would be a great way to do a unit study! Anyone who likes to learn that way would love this book. Kids who like to read. Kids who don't like to read could also enjoy this as an audio book! Anyone looking for books with a Christian worldview and promote character building and virtues.